Early in the morning on November 27 th I left the Radisson hotel with camera and binoculars. On the way to the Bubali Bird Sanctuary a lone Osprey was observed perched over one of the nearby ponds. Upon arriving at the observation tower I noticed the Tricolored Heron quietly seeking out small fish at the base of the tower. The Common Moorhens seem to be camped out at each of the ponds. After the Heron left a small unidentified Waterthrush was seen patrolling the water's edge. 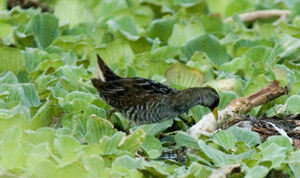 The Sora made a brief appearance as it moved thru the thick aquatic vegetation. Later in the morning several Yellow warblers , Blackpoll warblers , and Bananaquit birds were seen in the tree near the tower. At the larger pond a group of Brown-throated parakeets moved back and forth between the trees that bordered the pond. In the distance the Magnificent Frigatebirds circled over the area when something strange caught my eye. 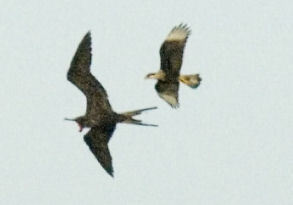 One of the birds that followed close behind was a Crested Caracara . After taking several photographs I started to head back when a Peregrine Falcon traveled through over the larger pond. I considered this as time well spent and after watching all these birds eating their breakfast I decided to seek out some food myself. 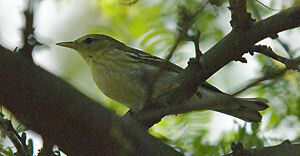 Blackpoll Warbler at Bubali, Aruba, November 2006. Photo by Rick S. (www.hawkwatcher.com). During the week at the hotel garden area I observed Brown-throated parakeets, Yellow warblers , Bananaquits, Eared Doves, Tropical Mockingbird, Carib Grackle, and Black-faced Grassquit. Birding in Aruba was lots of fun. 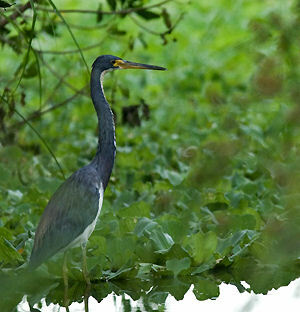 Tricolored Heron, Bubali, Aruba, November 2006. Photo by Rick S. (www.hawkwatcher.com).